A synth of serious importance - both musical and academic - this is up there with Animoog and Nave, even if it is a bit bewildering at times. Sounds superb. Easy to get good results quickly. Excellent arpeggiator/sequencer. 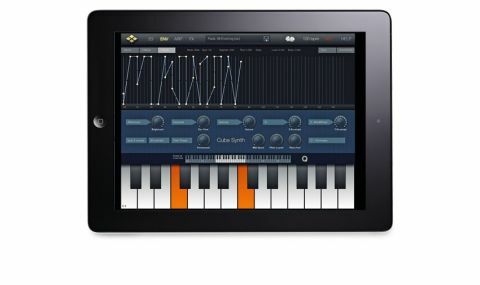 A scaled-down version of Virsyn's Mac/PC additive synthesiser, Cube Synth joins the pantheon of iPad 'power synths', producing ear-tingingly good sounds via a powerful, flexible, fun touch interface. "Cube enables you to get immediately hands-on with its top level parameters for instant results"
As any good iOS synth should, Cube enables you to get immediately hands-on with its top level parameters for instant results, then go far deeper when you're ready. 400-odd presets serve as excellent starting points, and the random preset generator is always worth a stab. Cube's architecture is built on four simultaneous voices, with 512 partials per voice. The Spectral Morphing engine enables controlled morphing between the four voices, with the path of travel drawn into the central XY display, and in-depth adjustment of the 64-stage Volume, X-axis and Y-axis envelopes done in a very detailed trio of editors. All three of these parameters can also be modulated by the usual list of sources (mod wheel, velocity, keytrack, aftertouch, etc), as can Brightness (a very effective global filter that moves in mysterious ways...) and overall envelope time. The Detail editors are beautiful to behold, enabling sweeping changes to be made to various per-partial parameters (Level, Pan, Envelope Attack and Envelope Decay), as well as the Morphing Filter (used to create all sorts of crazy frequency-manipulation and formant filtering effects) and the noise generator, which adds noise to the corresponding partials within its defined spectrum. Yup, this is complicated stuff. There's also a briliantly designed arpeggiator/ step sequencer that gives access to Note offset, Tie, Accent, Octave and Key within one window, and includes another Randomize button. At the end of the chain, a bank of seven well-furnished effects (EQ, Phaser, Delay, Overdrive, Ensemble, Chorus and Reverb) bring the polish. Cube's four-voice morphing setup is its headline feature, fuelling mind-blowingly organic, evolving tones over which extensive control is given to the user. It doesn't hurt that it just sounds superb generally, either, of course.